In a divided and increasingly dangerous world, messages of unity and togetherness cannot be overstated enough. You may have seen Sheryl Sandberg’ latest Lean In campaign video floating around on the blogosphere and in the media. 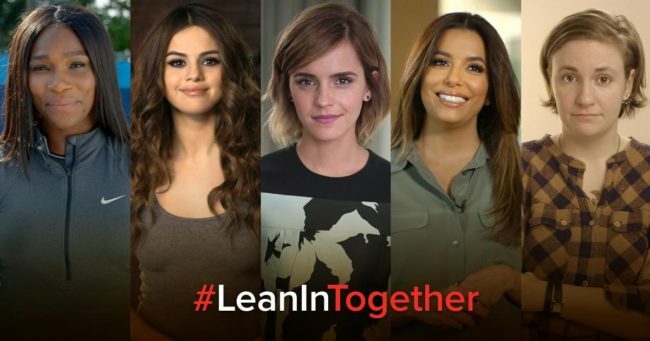 ‘Lean In Together’ is a very simple message that appeals to women from all walks of life and all ages, with a specific emphasis on career aspirations. Like most of the Lean In messaging, the campaign believes in using the power of unity to help close the gender gap in the workforce. Sheryl told ABC News in an interview that unless women everywhere don’t aggressively work to close this gap, it could take another 100 years to completely reach parity. As the colloquial saying goes: ain’t nobody got time for that! We want to see equality realized in our lifetime. 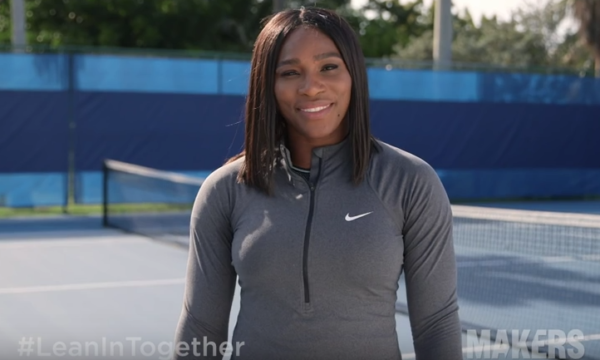 The video features a diverse selection of accomplished women in the public eye such as tennis ace Serena Williams, actress, producer & director Eva Longoria, ‘Girls’ creator Lena Dunham, Fox news anchor Megyn Kelly, and pop star Selena Gomez to name just a few. Each of them talk about the impact other women and mentors made in their life, whether it be to show them what leadership means, what self-belief looks like, and how to unapologetically chase your dreams despite the odds. “She has so much power but she wields it so compassionately and responsibly,” said actress Kerry Washington of her mentor, media mogul Shonda Rhimes. “One of the most heartening parts of this past year for me has been the outpouring of support I’ve received from women,” said Conservative news anchor Megyn Kelly, who is of course referring to her very public sexist slandering from Donald Trump. Whether you agree with her politics or not, the fact that a high profile man thinks he can get away with referring to a hard-working woman, who dares to question his public actions during an incredibly controversial political election, in misogynistic ways and show such immaturity, is just one example of why this presidential election has become such a heated event. “The idea that another woman was in some way taking what belonged to you, that whole idea is kinda shifting,” says Lena Dunham, who really reiterates that there is no need for competition once we start to realize there is room at the table for all of us. “We see all the time women supporting other women. And I think there’s a myth out there that women don’t, and it’s not true…when two men have a disagreement at work they’re having a “substantive” disagreement. When two women have that same disagreement at work it’s a cat fight. So we need to understand that women can speak with strong voices but that doesn’t make them ‘mean’,” said the Facebook COO. In her interview, Sheryl is asked how she is doing after the tragic and sudden death of her husband Dave Goldberg in 2015. She replied that it has been a struggle but she is working through it all. “I know I don’t have any choice but to keep going, and I keep going because I look deep and I find the resilience within myself, not every minute in every day, but as much as I can,” she explained. What’s awesome about this exchange is that she was not asked whether she intends to marry again and there was no hint of her looking to find her happiness or value in another partner. We think this is an important message to share as part of the Lean In Together campaign, because there are many scenarios in women’s lives where they have no choice but to dig deep and go the road alone, relying instead on friends and women in their social circles to give them strength. While Sheryl didn’t specifically say it was her female friends that helped her through her ordeal, we have no doubt that her story will impact many other women who have been through similar situations. “There are so many people who are struggling with things in their lives, and we get through it by leaning in together,” she said, admitting that she hadn’t planned on being publicly vulnerable about her situation, but due to her very public status, she used that as an opportunity to speak about it. What we find is the most compelling aspect of this campaign, and all of the Lean In campaigns, is that they are not meant to end with just a beautifully-produced video. They are really designed to empower and inspire all those who are watching to get up and find ways to implement the messages in our lives. Togetherness has never been more important than now. In a world where racism, division, politics, hatred, poverty, gender violence, misogyny, and so many other negative factors come up against us daily, Lean In Together isn’t just a warm and fuzzy feeling, it is literally a survival tool for everyone.